Chilli jam recipe | WTF Do I Eat Tonight? I seem to be on a flavour kick this week; the sweetness of baked spinach on Monday, the brightness of all those herbs yesterday and now, a chilli ‘jam’. 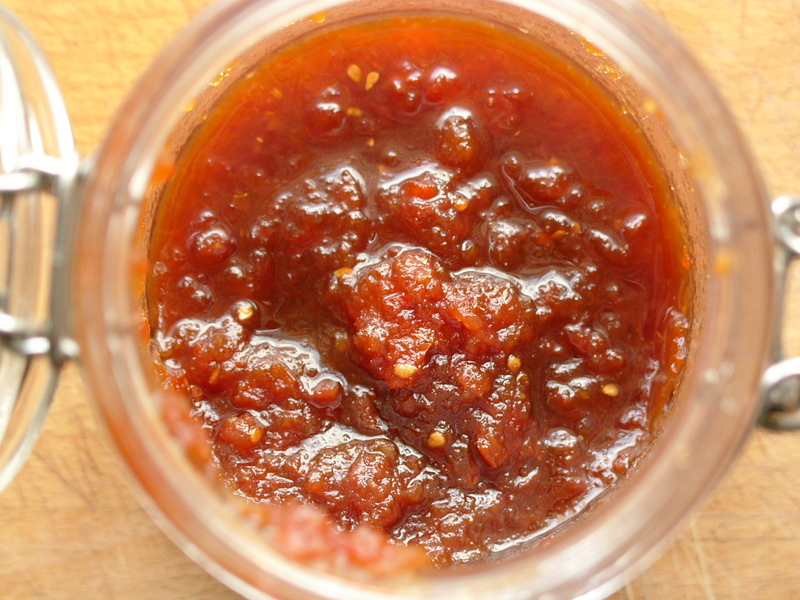 Immensely versatile, this is not really a jam at all, more of a salsa or chutney, and it’s a great thing to knock up when you want to lift something plain, like a piece of grilled fish or chicken, but without too much of a faff. It is also, weirdly though deliciously, gorgeous in an egg mayonnaise, ham and rocket toasted sandwich. I’m not kidding: I tried it here. The only fiddly bit of this is sterilising a jar but as long as you have a) a jar, b) a sink and c) an oven you can do it in about ten minutes. 1. First wash and chop the tomatoes then peel the garlic and ginger and chop those too. Top and tail the chillies then, if you want, deseed them or, for a sting-free experience, cut them up with some kitchen scissors. 2. Put the peeled garlic, chillies, ginger, fish sauce and half the tomatoes into a blender and blend to a purée. Tip this into a medium saucepan. 3. Now blend the rest of the tomatoes for a few seconds until chopped not puréed and tip those into the saucepan too. 4. Add the vinegars and sugar to the tomato mixture and bring to the boil slowly. 5. When it starts to boil, turn down the heat and skim off any foam that is on the surface. Then leave to cook uncovered on a gentle simmer for 30-40 minutes, stirring every so often to prevent any of the tomatoes sticking to the bottom. Push any jam on the sides of the saucepan down into the rest too. 6. When the mixture has been cooking or about 20 minutes, sterilise the jar. Heat the oven to 180°C/160°C/gas 4 then wash the jar in warm soapy water. Rinse and dry it with a spanking clean tea towel then put on a baking tray in the oven for at least five minutes. 7. Once the jam is thick and, well, jammy pour it into the hot jar and leave to cool. When it’s completely cold close the jar and store in the fridge. It should keep for a couple of months. PS This is not, as I mistakenly told my friends the other night, vegetarian because, doh, it has fish sauce in it. I wonder how I managed to miss that big, telltale word: fish. I’m obviously a Monty-Pythonesque Spam type when it comes to recognising what is vegetarian or not. Sorry S! This entry was posted in Cookery writers, Delia Smith, Delia Smith's How to Cook Book Three, One pot, Salsa and sauce recipes, Summer recipes and tagged chilli jam recipe, Delia Smith's recipes, salsa recipes, Tina. Bookmark the permalink. Pingback: Tortilla de patatas: a proper Spanish omelette | WTF Do I Eat Tonight? Pingback: The Modern Pantry Cookbook | WTF Do I Eat Tonight?